Above is the link to the orginal post from July 2015. K originally had this test done by her psychiatrist’s in July 2015. I should have posted her results a year ago. Why didn’t I? 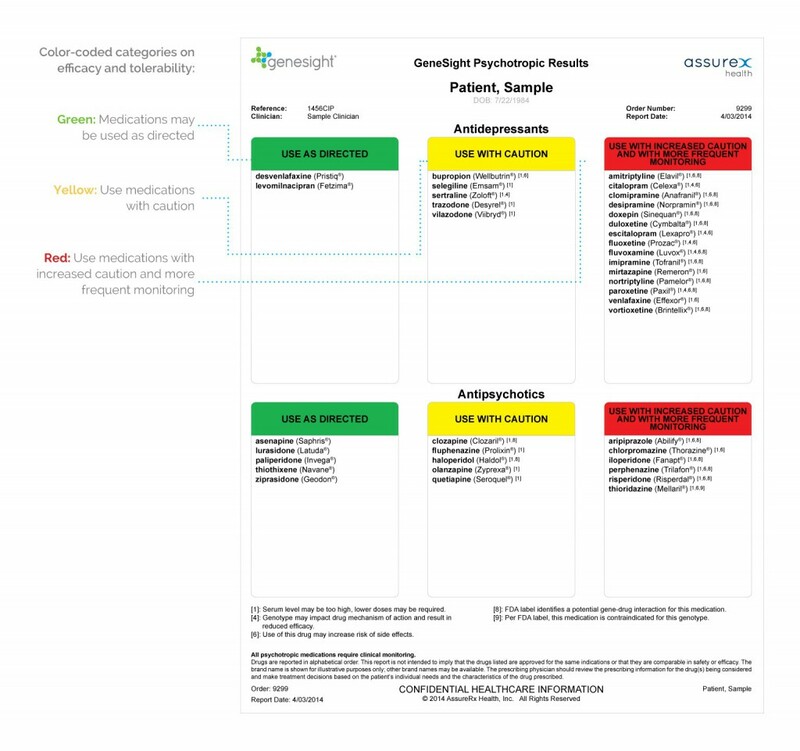 This GeneSight Psychotropic Testing is a swab done in the mouth. This test will tell you what is the best medicine to use based on the DNA of the individual. The reason I did not post the results, is because it turned out to be a disappointment were K is concerned. The photo above is not from K’s results. But to be used only as an examples. The results were disappointing so much so that the Doctor did not want to discuss the results with me. But she did when I insisted upon knowing the outcome. I wished it could be the miracle answer to the magic pill that would have helped K, but it was not. That is why I did not post the outcome until a year later. But in a way it is like asking advice from other people on a new medication. Did it work for you? Did you have a good experience with that medication? OMG, I am not using that medication becuase Joe Shmoe had a horrible reaction!!! My experience with the GeneSight Psychotropic Testing may not be the same experience that you have. It may hail the wonder drug that will work for you or your loved one. Like I have said in my other post about medications (To Medicate or not to Medicate that is the question) – Do not let anyone’s horror stories or sworn testamony of mircales have any impact on whether to give the medicaton or not. In this case – Do not let anyone’s horror stories or sworn testamony of mircales have any impact on whether you take the GeneSight Psychotropic Test! If this test can help anyone and reduce the trial and error games of prescribing medications than it is a benefit!!! The test is best on individual results – again K’s experience may not be your experience!